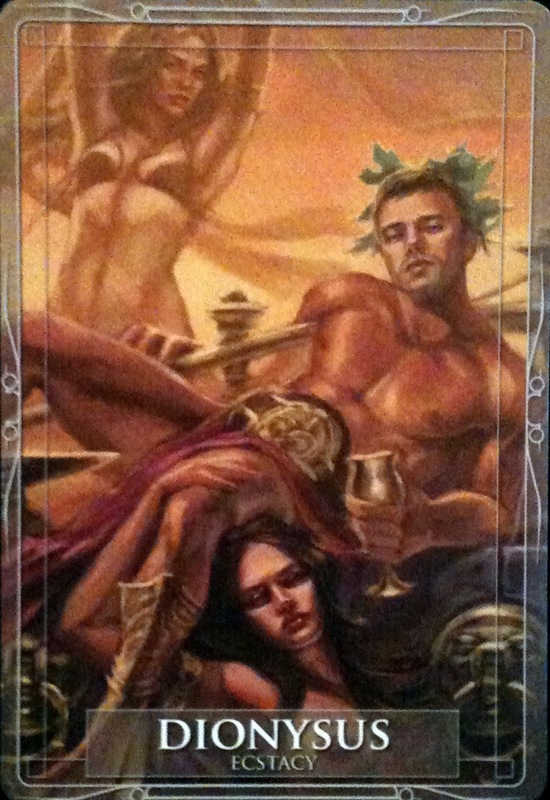 Today's Draw: Dionysus from the Gods and Titans Oracle. What brings you to ecstasy? How often do you allow yourself to just let go? And what do you want to bet a lot of people peek inside this post and its responses today? We often think of Dionysus as the God of Wine (and free love) and he was. But his gift was so much greater than that. Back in ancient Greece, women and minorities were restrained by society (SO unlike today *eye roll*). And Dionysus was known as the great liberator. The repressed would worship his "no rules and total freedom" approach and after spending most of their days and nights in restraint, they could finally let go. Cults grew and he became one of the most popular Gods of the day. Even now, he is among the best-known Gods of ancient times, even though many held more power on Mount Olympus. 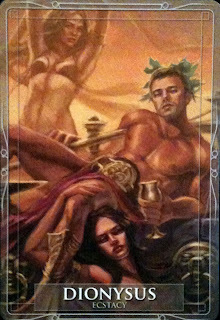 When I pulled this card it was hard for me to think of a recent example of how I let go. Now, don't get me wrong, I've done my share of drugs and drinking and improper behavior, but I've left most of that in my past, primarily because I don't have the energy for it anymore...haha. And there are, let's say, some private situations in which I have no problem letting go. But when I think back on my life, I can't honestly describe myself as Dionysian at any phase. This card isn't suggesting that we adopt it as a new lifestyle, though. It's simply saying that jumping out of your box and getting jiggy with life can sort of blow the gunk out of your system and revitalize you...remind you you're alive. Some might skydive or bungee jump, for example. Others might dance or sing. Still others may find their release through spiritual means or even through a wild affair. When we think of Dionysus, we think of alcohol. I'm not a drinker, but every once in a while I'll break loose that way. However, it's a sticky wicket, because this isn't about drinking yourself to sleep every night or doing drugs in excess. Nor is about a skydiving instructor going skydiving every day. It's about letting go in ways that aren't part of your routine and don't turn you into a zombie. It's about reaching moments of ecstasy that are outside of our day-to-day experiences, take us out of ourselves and leave us feeling renewed. A couple of years ago I went to a Krishna Das and Deva Premal concert with a friend. Both of these performers are chanters (think along the lines of the Hare Krishna song). There's something about chant...in fact, it's often called ecstatic chant. This was, 3 or 4 hours of solid chanting and, very unusual for me, dancing and swaying. It was total loss of self. Total loss of ego. And in a way that energized and fed me for days. Chant always does that for me, whether in a group or in private meditation. While writing this, I reminded of other ways that bring me out of myself. But I was also reminded of how rarely I give this gift to myself. What about you?